We had a great event last night in Jesus Centrum Kassel. 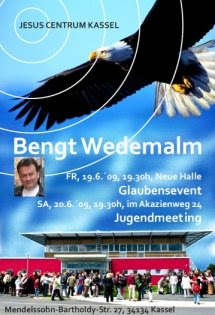 Glaubenfest(FaithParty). I spoke from Matthew 14 and it is always great to preach faith in Germany. Reasoning and scepticism are “strongholds” in this nation but once the spirit of faith starts to move in believers great things will happen and the Kingdom of God will increase with power and influence. Today I am preaching again here in Kassel and now I am in my hotel room, missing my family as always when I am away. Now I will go for a long run in Kassel and later I will meet up with Matthias and Sabine…great friends.